Through the month of March, KGOU airs lectures from the University of Oklahoma’s inaugural Teach-In, A Day with Some of the Greatest Teachers in America. This episode is a lecture from Gordon Wood. 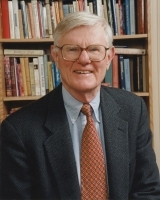 Wood won the Pulitzer Prize for History in 1993 for his book, The Radicalism of the American Revolution. His speech presented Feb. 27 is entitled, “What Made the Founders Different.” Special thanks to the University of Oklahoma’s Institute for the American Constitutional Heritage, and its director Kyle Harper, for assistance in making this series of programs possible.